Four referendums are on the ballot for the 2017 ASUC election. 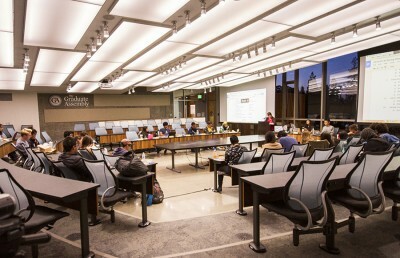 On the ballot are the Big “C” (Big Community) Referendum, the Housing Security Referendum, or HSR, the Community and Career Connections Initiative and the Life at UC Berkeley EXpansion, or LUX, Referendum. If passed, the Big “C” Referendum will expand the staffing and services offered through the Centers for Educational Justice & Community Engagement, or EJCE, according to campus junior Ifechukwu Okeke, the referendum’s primary proponent. These student resource centers include the Gender and Equity Resource Center, or GenEq, and Multicultural Student Development, or MSD. Okeke added that EJCE centers have been affected by budget cuts, and the referendum will ensure that they continue to serve the students. “These spaces exist to have marginalized students feel like they have a place on campus and can contribute to campus climate and folks who don’t carry these identities can learn how to exist with these people who do,” Okeke said. According to Okeke, the referendum’s fee will be $29 per student per semester, but will also be adjusted for inflation. If passed, the referendum will last for 10 years, beginning in fall 2017. 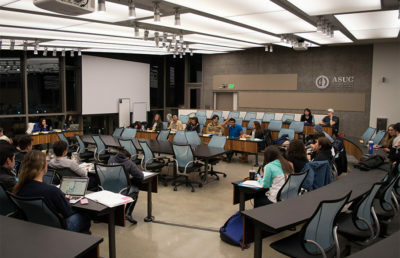 The fee will be distributed among several areas, according to the EJCE website — 33 percent will go toward low-income students by paying their ASUC tuition fee, 25 percent will go to GenEq and MSD staffing, 21 percent will go towards EJCE programs and projects, 12 percent will go toward student internships and 9 percent will fund student-initiated projects. Okeke acknowledged that some people might vote against the referendum because they believe it will only help certain groups on campus. She said, however, that this referendum affects all students. According to SQUELCH! 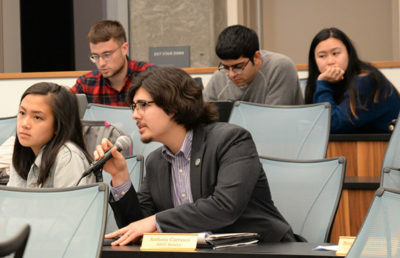 Senator Anthony Carrasco, primary proponent of HSR, the referendum will alleviate the cost of housing by acting as a loan scholarship that will pay for students’ security deposits. If, however, students are unsuccessful in getting housing, they will not have to pay it back. If passed, the referendum will charge students $4 each semester and will last four years, starting in fall 2017, Carrasco said. Unlike some referendums, the cost of HSR will not increase over the years. Students will be able to apply for and receive the loan scholarship at any time during the year. Thirty-three percent of the fee will go back to financial aid and 20 percent will go toward hiring a staffer, who will be in charge of managing the loan scholarship, according to Carrasco. The remaining 47 percent will go toward the fund itself. Carrasco admitted that some students may vote against the referendum because they might believe that it is “too sympathetic.” He added that some people might want students to have to pay back the loan no matter what. He said, however, that affordable housing in the Bay Area is a crisis, so he believes this referendum is necessary. The Community and Career Connections Initiative will sustain and expand the campus Career Center and the Public Service Center, which connect students to public service and career opportunities. The referendum will cost $18 per student per semester and will increase by $3 every year for five years, ending with a total fee of $33, according to the referendum proposal. If passed, the referendum will begin in fall 2017 and end by 2027. According to the referendum proposal, 33 percent of the fee will return to financial aid, 3 percent will go toward a pooled impact fund for student initiatives, 43 percent will go to the Career Center, and the remaining 21 percent will go toward the Public Service Center. Student Action Senator Monsoon Pabrai, the primary proponent of the initiative, said in an email that some students may have concerns about the increase in tuition. She explained, however, that the campus is “in need of serious funding” for these programs. 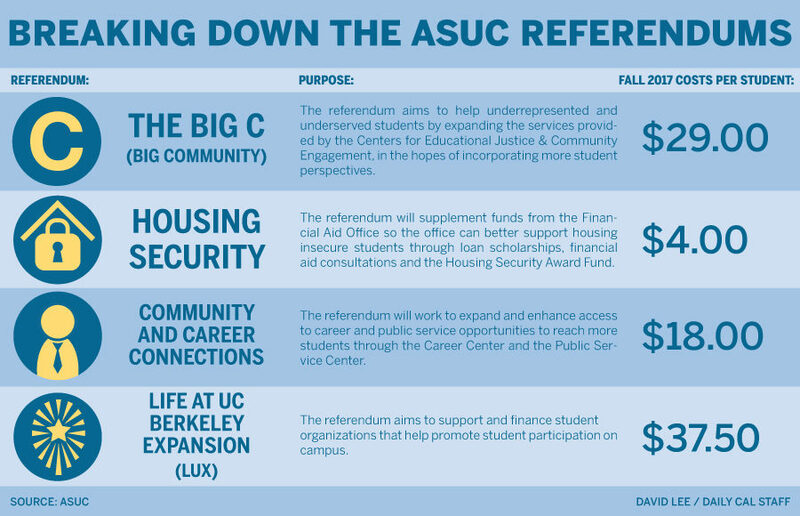 The LUX Referendum aims to increase the ASUC student activity fee by $10 per student per year for the next three years to support student organizations on campus After the first three years, the fee will be tied to inflation thereafter. The current Student Activities Fee is $27.50, and, if the referendum is passed, the fee will increase to $37.50 per student for the fall 2017 semester, and will reach a total of $57.50 per student per semester by 2020. According to Paul Cho, primary proponent for the referendum, LUX is a joint referendum between SUPERB, a student-run entertainment programing board, and an original BEAR referendum. According to the referendum proposal, 33 percent of the fee will be returned to financial aid. The rest of the money will be distributed to on-campus entertainment programming, according to the referendum proposal. Cho said the ultimate goal for the referendum is to fund ASUC operation costs, which will help campus organizations. “There’s always a sentiment of increasing student fees in the past, and I wholeheartedly recognize the student fee and tuition they pay, but (the fee) ultimately goes back to student (organizations),” Cho said. Contact Jessíca Jiménez at [email protected] and and follow her on Twitter at @jesscajimenez_dc.